There are still an unsettling number of people who believe that if you no longer live in the U.S., you're no longer liable to pay taxes here. Unfortunately, this could end up being a catastrophically costly mistake. The fact is that the U.S. is one of the few countries in the world that bases its tax system on residency and citizenship. It doesn't matter whether you live, work, and earn your income elsewhere. The same tax system still applies even if you're paying taxes into your new country's tax system. As an American citizen, you're still obligated to file your tax returns in the U.S. every year if you have a certain level of income ($10,400 for a single person in 2017). Filing doesn't necessarily mean you're going to actually have to pay taxes, as there are various exemptions you may qualify for (which I'll mention below). But essentially, the U.S. government says that's not for you to determine on your own, and your income must still be reported annually. Failing to do so will potentially lead to you being pursued by the IRS for moneys owed. You can be fined or even have your passport revoked. Because you're required to file taxes no matter where in the world you are, some people think that the only way to lower their taxes is to renounce citizenship. Though this might be true in some extreme instances, there are actually many ways to retain your citizenship and still lower your U.S. taxes. The Foreign Earned Income Exclusion was designed to help you avoid double taxation, and will allow you certain tax exclusions provided you meet the criteria. These might include foreign earned income as well as foreign housing, and the IRS offers a simple way to check if you're eligible through its Interactive Tax Assistant Tool. The Report of Foreign Bank and Financial Accounts (FBAR) regulations are often misinterpreted. Some people take them to mean that if none of your foreign bank accounts have a balance of over $10,000 dollars, you don't have to report them. In reality, the rules clearly state that you must submit an FBAR if "the aggregate value of all foreign financial accounts exceeded $10,000 at any time during the calendar year reported." This means that if you have one or more foreign accounts, you need to add the balances together rather than count them separately. It's not just bank accounts, either, and includes any "bank account, brokerage account, mutual fund, trust, or other type of foreign financial account." It's also not limited to your own accounts; it covers any account in which you have a financial interest or have signature authority over. If at any stage throughout the year they cumulatively totaled more than $10,000, you need to fill out the FBAR. Failure to do so can be punishable with a fine of up to $100,000, or up to 50 percent of the balance of the accounts at the time of the violation, for each violation. 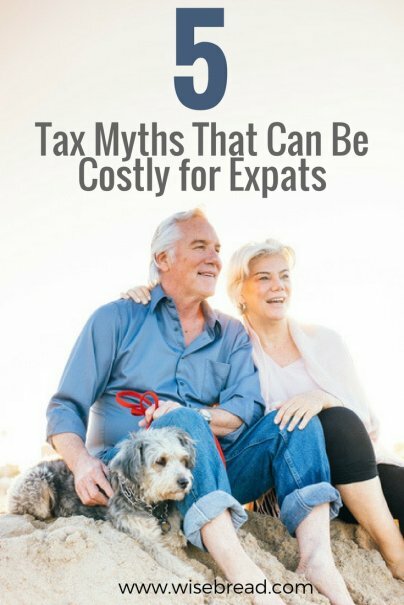 There are a significant number of U.S. citizens who have lived outside the country for many years without realizing they need to pay taxes. For those people, it can be daunting to think they suddenly have to start filing taxes again and declare earnings to cover the entire period of living outside the U.S. Nobody wants to become liable for thousands of dollars of back taxes, and it can be tempting to think you've gotten away with it for so long, so why change now? Luckily, in recent years, the government has made it far easier to manage taxes owed with introduction of what is known as streamlined filing compliance procedures. Essentially, you have to certify that your nonpayment of taxes was due to "non-willful conduct" rather than deliberate avoidance, and you'll be able to come clean consequence-free. It's beneficial for both the government, who gets taxes they otherwise wouldn't be collecting, and the taxpayer, who no longer needs to live in fear. Even if you're living off the grid on some far-flung desert island and haven't been back to the U.S. in years, if you have a bank account, you're probably traceable. Under the Foreign Account Tax Compliance Act of 2010 (FATCA), foreign financial institutions must pass on data relating to the assets of any of their clients who are U.S. citizens. Your financial records are transparent, so regardless of whether you report your accounts or not, the IRS can still access them. Though you might think it's unlikely that you'll be investigated unless you're a wealthy individual, don't bank on it. The IRS has explicitly claimed it's getting harder and harder to avoid detection, and if you're still operating outside of the regs, the net is closing in. It’s not worth it to try to avoid the IRS, even if you’re living overseas. Facing up to your responsibilities will ultimately be easier in the long run.